SmarterQueue has been all the buzz lately and I tried it out for myself to see if it works for me. While I have been using CoSchedule forever, I decided to try it out, and I am sharing my findings. Every now and again I like to get out of the kitchen and put my tools down and embrace my techy side. The side of me that likes to know how things work, how to work smarter and not harder, how to undo and redo things if I want to. I like to help others do the things that their own technical challenges prevent them from trying to do or figuring out, or do the research so that you don’t have to. Today that is what I have done, a bit of research looking at two of the leading social schedulers out right now – CoSchedule and SmarterQueue. Now let me tell you that the links in this article may be affiliate links. This means that if you click on them and sign up, I either get a commission or a discount off of my services. But this does not sway my thoughts, opinions or information that I am providing you. I provide a full disclosure here for you. Now that we got that out the way, let’s talk about these Queue’s. I have been using CoSchedule for pretty much as many years as I have been blogging. Back when they were literally just a social scheduler and their plan was only $10 a month. They have grown into so much more than that. I started using SmarterQueue a few months ago to see what it had to offer and how it could ease my workload if it was a replacement or a complement to what I already had, and what all the hype was about. One of the things that both of these services have that I think speaks volumes in their belief of what they are capable of, is that they both offer a free 14-day trial that allows you to try it before you buy it. All without providing your credit card information. This is my overview of the both of them. SmarterQueue is a social media scheduler that allows you to utilize evergreen recycling to get increased engagement and shares of your posts. 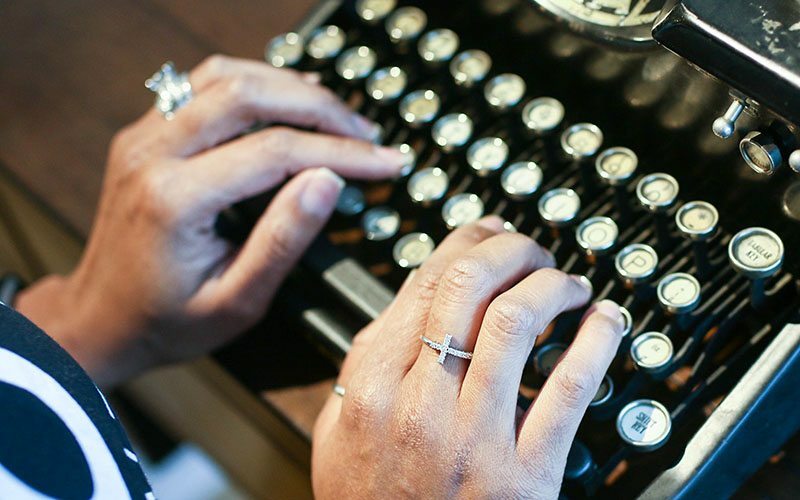 You set up your schedule and tell it when you would like your content shared and where. When adding content to your calendar you are given the option to schedule it once or add it to your Queue for resharing for as long or as little as you would like. CoSchedule is a tool that interacts with the other parts of your social scheduling that allows you to reshare relevant content without being spammy. It has several other integrations and tools to help you beyond just social sharing. 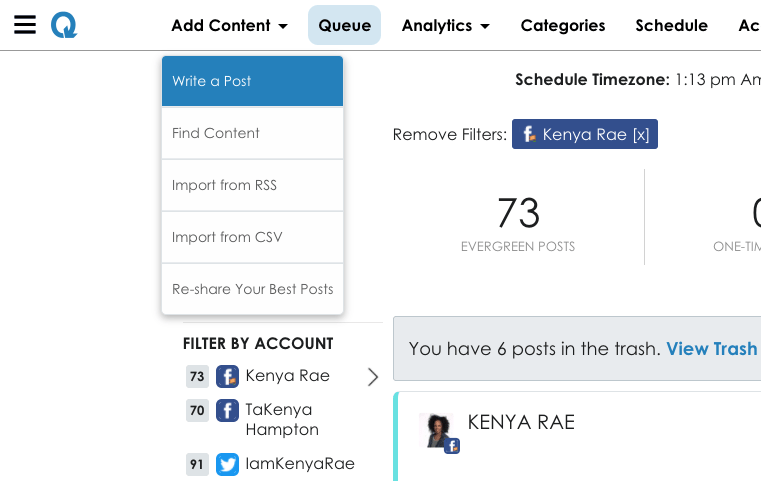 With it, you build your social schedule and set posts that are evergreen to be reshared and ReQueue fills in the gaps to your social schedule allowing you to streamline your social sharing strategy. While I have previously shared with you how I use CoSchedule in my blog content creation process, I would like to focus on the social aspect of the two of these. With SmarterQueue there are a few steps that happen when you first get started. Let me note that Instagram does not allow you to fully schedule your posts. So like other services you will download the app and it will send you a notification to publish at your scheduled time. They are currently working on adding Pinterest and Google and you can request to be notified when those account types are available. You are also able to connect with your Bitly account so that you are able to use link shortening and tracking for your social posts. You can add categories, however, fits best for your business and color code them when adding them to your calendar. With creating your schedule in SmarterQueue, you take your categories and add them to time slots. So with the categories, I have listed above, I may want to add posts from my blog two times a day on my facebook page but then 6 times a day on twitter where content has a shorter viewable life. So you set up your schedule according to what time you want to share what and on what days. There is an excellent video demo below for what this looks like. Once you have your accounts connected, your categories set, and your schedule together you can begin adding content. Adding a new post is pretty straightforward. Of course, you want to share your own content, and there are some great tools for doing that, like looking to see what has gotten the most engagement and then setting it to requeue. But you should also be sharing content from others as well. This helps you to make new internet friends, provide your audience with a wide range of information and gives you new ways to interact with your audience. 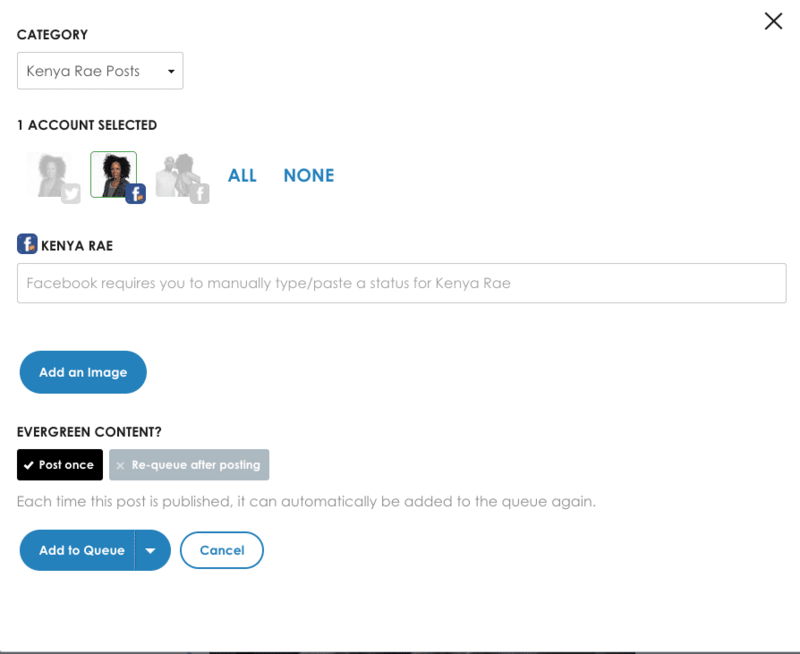 SmarterQueue has a feature that makes it easy for you to find content from others. This to me is where SmarterQueue shines! You can literally pull the RSS feeds of other sites and social accounts. Searching things such as keywords, hashtags and more. When you find sources that you like to share from regularly, you can add them to your bookmarked folders so you don’t have to think about what to search later. Once you have your content set to share you can literally set it an forget it until you are ready to add more. I will also note that it has the ability to look at how much you have set in a queue and how often it would share and choose stop sharing until more content is added to avoid you appearing to be spammy! With CoSchedule’s ReQueue it is similar, but a little different. CoSchedule has positioned themselves as more than a social sharing service. ReQueue is a part of the services that they offer within their plans. 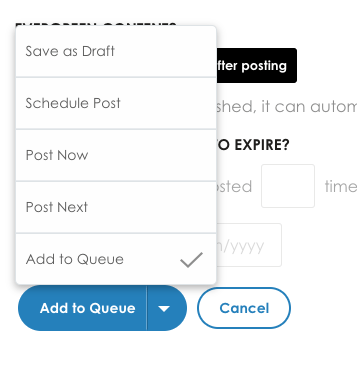 With ReQueue, you still create groups, add content to the groups, but CoSchedule intuitively looks at your content sharing and fills in the gaps in your selected time slots. You can even set timeframes on the groups, for instance, if you have a group that is only for a specific holiday or a launch that you are having, etc. To see it in action Kristen from Sweet Tea and Saving Grace has a great tutorial on how to set this up. You can catch below. 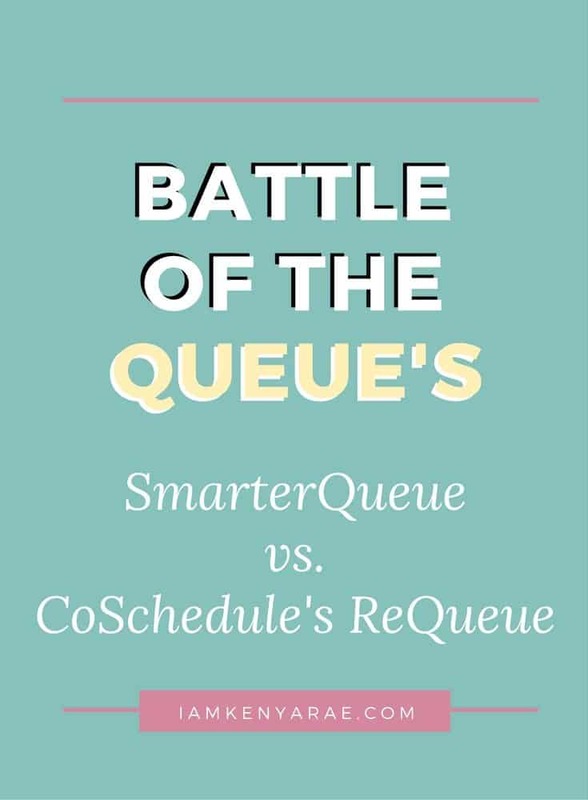 For me, CoSchedule and SmarterQueue are not fully competitors. SmarterQueue is a dream for social media scheduling and easily finding content to share from others. CoSchedule is amazing for a blog content strategy. With its integrations with bitly, google drive, Evernote, WordPress and others you can manage a great deal of your process all in one place. The costs of the tools that you use can add up. So I understand that price is always a consideration when choosing what tools to invest in. I currently am on a pricing plan with CoSchedule that is reasonable but can be hard to swing for a solo entrepreneur. It currently allows for discounts for reviews and referrals. Which in my personal opinion makes it easier to manage financially. They also give the ability to create a custom plan so that you can select what is important to you. I have to say that I can not definitively say which one you should go with. I am currently using both. They both have the ability to utilize social tagging, which is a great added bonus, and a feature I won’t give up. I started using SmarterQueue to see if it could replace CoSchedule. While I tried I could not give up my google integration which has to be my favorite feature of CoSchedule because that is where I like to create my content. If I absolutely had to choose, between the two, I honestly would choose SmarterQueue. And if the price of CoSchedule goes up or the referral plan is taken away, I will have to let go of CoSchedule at this time. I would like to give you the opportunity to try them out and decide for yourself. Using the links below, you can get a free trial for one or both of them. Click here to try out the 14-day free trial CoSchedule offers to all new users. Also, by using my link, you can get a FULL MONTH, instead of the regular 14-day trial, with SmarterQueue. Let me know if you have any questions about either that I did not cover in the comments below. Hi, Kenya! I stumbled upon this blog article when I searched for “how to convert from ReQueue to SmarterQueue”. Was there an easy way to import or convert all your groups from ReQueue into SmarterQueue? Or did you have to start from scratch with your group libraries and all the individual posts for your categories? Did you get customer service involved?